Born at Edmonton, Alberta on 15 December 1917, he attended the University of Manitoba, where he was Senior Arts Stick in 1937, and the Manitoba Law School, graduating from the latter in 1941. In May 1941, he enlisted with the Canadian Army and was deployed in England and northwest Europe. He returned to Canada in July 1945 and served with the Directorate of Repatriation, retiring with the rank of Lieutenant Colonel. He was Executive Assistant to Douglas C. Abbott, the Minister of National Defense, from November 1945 to May 1946. Returning to Winnipeg in 1947, he practiced law with the firm of Pitblado and Hoskin until retirement, except for a period in 1949 and 1950 when he was Secretary of the Royal Commission on Transportation. He was made a Queen’s Counsel (1958). In 1941, he married Constance Guy, daughter of Robert D. Guy, and they subsequently had three daughters. 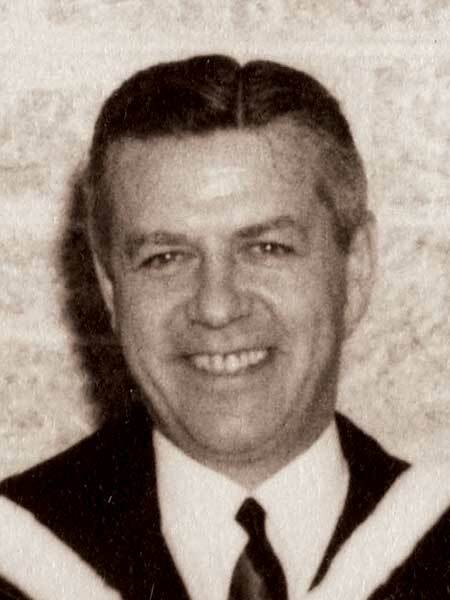 He was President of the Winnipeg Chamber of Commerce (1961-1962) and Canadian Club of Winnipeg, and National Chairman of the Alumni Division University Capital Fund. He served on the boards of several Canadian and international corporations. In 1963, he received the University of Manitoba Alumni Jubilee Award for distinguished achievement. He was a member of the Manitoba Club, St. Charles Country Club, and Winnipeg Winter Club. He died at Winnipeg on 5 December 1995. His honorary pallbearers were A. Edson Boyd, Stanley W. Carter, William M. Coghlin, Albert Cohen, William C. Gardner, Justice Ted Glowacki, R. O. A. Hunter, Duncan J. Jessiman, Sterling R. Lyon, Alan McPherson, William L. Palk, Peter M. Ramsay, George T. Richardson, Conrad S. Riley, John A. Scollin, Alan Sweatman, and Harold Thompson. Obituary, Winnipeg Free Press, 9 December 1995, page 50.